We invite you to an enjoyable 6-mile or 12-mile walking tour of the past and present life of Baton Rouge, the capital city of Louisiana. 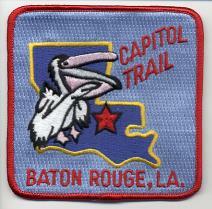 The Capitol Historical Trail, as this self-guided tour is called, features stops at many historical sites and museums. The 12-mile trail begins and ends on the Louisiana State University campus. There is an optional stopping point after 6 miles at the Louisiana State Capitol. The resting point, after 4 miles, has benches and garbage containers and is therefore an excellent location for eating a sack lunch. The printed trail literature includes a map. The hike is free-of-charge and open to the public, and is commonly hiked by youth groups. Due to its historical focus, the hike is well-suited for middle school and high school history classes. The historical significance of the hike was certified in 1973 by T. Harry Williams, Boyd Professor of History at Louisiana State University. 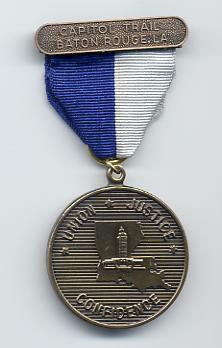 The trail is also certified as a nationally approved historic trail by Boy Scouts of America. The printed trail literature includes both standard walking instructions as well as compass-based instructions for youth groups wishing to learn or practice orienteering skills. For the printed trail literature, please see our separate literature page. To cover our costs (we have no other source of income), we charge a small fee for these items. Hikers are under no obligation to purchase awards. Information on how to purchase the awards is included with the printed trail literature.